Home › Articles and Speeches › Inspiration People: What would you do with $100 million? Inspiration People: What would you do with $100 million? Knowing what you would do if you had a hundred million bucks will reveal your true self and what you value most, says HealthStats International CEO Ting Choon Meng, who has some 80 patents to his name and another new invention to tackle the scourge of diabetes. The iconoclast tells Susan Long how he’s given it all away to improve the intellectual property landscape here. MOST days, as early as 5.30am, a line snakes outside T&T Family Health Clinic in Kitchener Road. By 9am, there are about 30 patients with orthopaedic and cardiovascular problems waiting to see general practitioner Ting Choon Meng. They come from as far as Indonesia and Taiwan, based on word of mouth, to see the doc known for his “engineering approach to clinical problems” and pioneering joint injection techniques. The 53-year-old serial inventor spends half his day seeing patients and the other half at HealthStats International at New Industrial Road, which he co-founded 12 years ago. 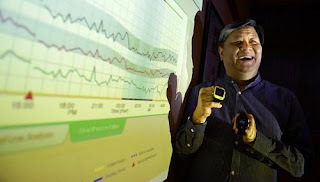 With more than 80 patents to his name, he is the creator of the BPro, a wristwatch that monitors a person’s blood pressure throughout the day. In 2007, the device won a World Economic Forum Technology Pioneer award, which counts Google and PayPal among previous winners. That year, he was offered US$300 million for HealthStats, but turned it down, to the chagrin of shareholders. There have since been other offers to the tune of US$800 million (S$982 million), but he is holding out for a partner with global reach to take his devices to the masses. Failing which, he is preparing for a listing in early 2014. HealthStats, which has 50 staff and offices in Suzhou, Shanghai, London and Milwaukee, Wisconsin, is about to unveil its next game changer – a non-invasive blood sugar monitoring device to tackle the looming scourge of diabetes. It is now undergoing trials to secure regulatory approvals. His other claim to fame is suing the Ministry of Defence for knowingly infringing intellectual property (IP) by producing a mobile casualty station similar to his 2003 invention, The Swift, which can unfurl, Transformer-like, within minutes into an emergency room to treat up to 240 patients. He has sold 10 of such patented stations to the Singapore Civil Defence Force and is in talks to license it to China, Brunei, Jordan and Taiwan. He will not say more beyond, “I’m a son of Singapore, making a stand that IP needs to be respected”. HE HAS always defied convention, refusing to colour inside the lines. From young, he stood in for his seaman father, who was seldom home, while his seamstress mother toiled. By age 11, he was cooking, ironing and tutoring his four younger siblings. The Pearl’s Hill Primary, Gan Eng Seng Secondary and National Junior College student was the only one in his family to qualify for the University of Singapore medical school. But during his Officer Cadet School training, his right index finger got sliced off during bayonet sparring. While he healed, he was held back a year and became an NS drug aftercare officer, keeping track of 40 drug addicts, who taught him all about life at 19. As a medical officer, he opted to go to Woodbridge Hospital and learnt clinical hypnosis, which he later used to repair tendons and set fractures in emergency surgeries. He had a natural affinity for the “mechanical aspects” of orthopaedics but stopped short at specialisation, opting for the “quiet life” of a GP. In 1999, troubled by seeing patients who would shortly after die of a stroke or heart attack and feeling that “the disease was always one step ahead and I was behind”, he started researching and tinkering after hours. Together with co-founder and software engineer Chua Ngak Hwee, 51, he came up with a novel way of measuring central aortic pressure (the blood pressure near the heart) over 24 hours and a non-invasive technique of recording waveforms from the arteries via a wrist sensor. It rocked the boat. But private investors, the medical fraternity and government officials alike snubbed him. When Sars (severe acute respiratory syndrome) hit, he sold off his retirement nest egg of 10 condominiums in Malaysia and three of the four clinics in the private practice he had built up here to keep HealthStats afloat. Cardiologists here boycotted his talks. “I’ve been told countless times I’m only a GP… Re-learning is uncomfortable,” he concedes. Economic Development Board officers asked him where he took the technology from, implying he copied it, and remarked: “You mean a Singaporean can do this?” Others took issue that he had no PhD, only a medical degree. And that his was a “local company, single product, with no track record”. “But you got to start somewhere, isn’t it?” he fumes at the memory. “It’s called colonisation of the mind.” He lambasts the prevalent IBM mentality here, which denies home-grown technologies a chance. Singapore needs to bet on itself more. “All things being equal, we should get local brands. The Government should be the first and main customer of local enterprises, as in Japan and Germany,” he advocates. Today, he sits on many boards and committees within the National Research Foundation and Spring Singapore to help mine for the next big idea in life sciences and biotechnology to fund. As someone who has done it himself, he sees his role as helping to pick up “raw diamonds that don’t come shiny but can be honed”. He looks past bumbling presentations and those who “don’t say what you like to hear” to the possibilities beyond. He wants to be the somebody he always wished would fight for him back then. His best vindication today is when his detractors end up wearing his devices and ask for his help to interpret the results. Today, all the hospitals here, including some clinics, widely use his wireless monitoring devices. Interest picked up after a 2011 study in the Journal Of The American College Of Cardiology concluded that his technology for calculating a person’s central aortic pressure was a more accurate predictor of stroke and heart disease compared to the more invasive technique of inserting a tube directly into the aorta. Recently, Britain signed up 10,000 patients for his wireless monitoring on a year-long pilot study, which will be followed by 100,000 over the next two years and three million patients in 2016. In Chengdu, he has helped to design and build 30 screening booths to measure blood pressure and blood sugar levels in the villages. These are operated by a nurse and connected via Internet to the hospitals, which are deluged by outpatients with chronic illness. The General Hospital of the Airforce of the People’s Liberation Army in Beijing and its 300-over subsidiaries across China have also adopted his devices and the central pressure as the gold standard to screen, select and treat pilots. SO HOW does it feel to be on the cusp of great riches? To pre-empt the problems untold wealth will bring, he has given it away before he has it. Four years ago, he set up a trust company Jian Li (meaning “to build and benefit”) to do good works and assigned all his shares to it. In the event HealthStats is sold, all the money goes to the trust, which will only pay him “a minimum sustenance income”. He says he did this so he will not be “clouded by personal gain” or distracted from trying to take his technology worldwide in negotiating the sale. The Buddhist, who believes in the adage “love people, use money”, admits he is not impervious to nice things. He is a watch collector and a single malt whiskey aficionado who makes a signature sugar cane-smoked chicken dish and talks constantly of setting up a chef’s table restaurant. Recently divorced with a daughter in medical school, he lives in a detached house in the north of Singapore with his parents and two siblings and drives a BMW 740 and a Toyota Alphard. But he thinks everyone should plan – just as an academic exercise – what they would do if they had $100 million because it shows their “real raw self”. As for him, he’s decided to use his stash to improve the IP landscape in Singapore and fund scholarships. For starters, Jian Li will help pay for Singapore Management University’s new Singapore Patent Law school. For the past two years, he has committed $350,000 to sponsor 10 SMU and 20 Pioneer Junior College students from mostly poor families who show vast improvement in their grades and have a sense of social responsibility. There is no scholarship bond but he makes them sign an undertaking to “pay it forward” when they reach 30 or are financially able to help other needy students. He is also looking into starting a social enterprise, possibly in regional eco-tourism. The iconoclast hopes that how he’s chosen to spend down his wealth will spur others to think harder about the real utility of money. Come what may, he intends to continue on with his GP practice. It gives him the “mandate” to speak in front of other doctors, and his patients, in turn, give him fresh daily “inspiration” for new inventions. I want to teach Singaporeans to mine their oilfields – which are not in the ground but in their brains – to create intellectual property. I’ve an idea for an Idea Bank, where anyone can deposit ideas. They get paid for it if it gets picked up. A team of technologists can take the idea, build on it and make a product out of it. The world is our licensee and we don’t need a huge manufacturing base; we just need to be able to mine ideas, refine it and sell it. This is how we create a buzz of innovation so we don’t have to go and build another casino. In research institutes, the KPI (key performance indicator) tends to be filing patents. To them, IP equals patents and patents equals IP. This could not be further from the truth. Look at Coca-Cola. Its recipe, a trade secret, is kept inside the safe. Imagine if it filed a patent, the whole world would know what Coca-Cola is made of. You need an IP strategy, which means thinking of the business model, then working backwards to decide what to do – to file, not file, keep secret, brand, whatever. The second thing about IP is that everybody thinks we file a patent, have a product we can sell, then protect it, enforce it and sue infringers. But that is a very low form of IP. The highest form is in the licensing of IP. That means I don’t even need to make products; the IP is a product.